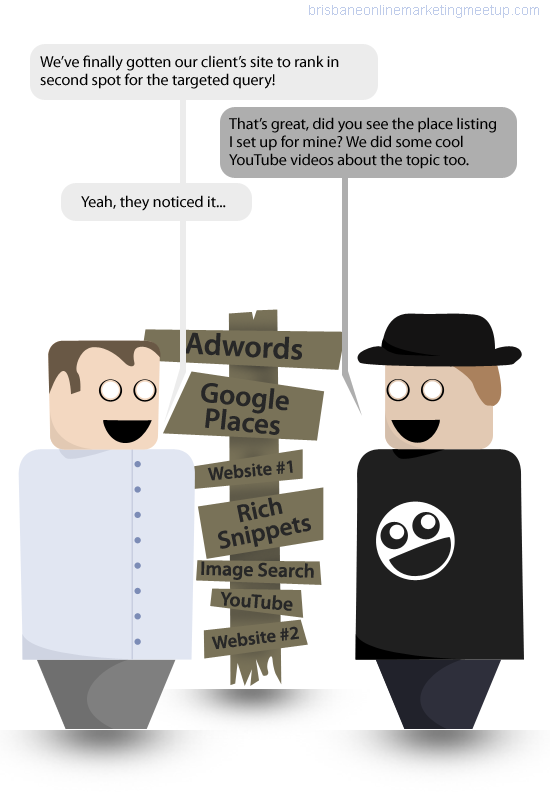 Marketing a brand in search isn’t the same as promoting content on a generic, keyword matched, nondescript domain. Search engines like Google treat entities such as brands differently on the results page, and possibly in how they rank too. A brand and a brand website create their own query space, are distinct in their vertical, and sometimes can even change how language is used, with an obvious impact on how people behave while searching. Brands are the solution, not the problem, brands are how you sort out the cesspool. Since the Vince / Brand update and Eric Schmidt’s infamous ‘cesspool’ remark, a lot has been written about how Google treats brands in search. Sites directly linked to brands appear to have an easier time ranking, can occupy more space on the results page and can have an edge over aggregators competing for long tail queries including brand terms. Brands benefit from more than just the way Google handles and displays data. As significant as the Vince update and Google’s changes to their search engine results pages are, there is more to marketing brands in search than the mechanics involved. It takes time, money and consistent performance over time to build a brand. Being an Apple or a Coke isn’t cheap, and maintaining a market-defining identity is hard, as the Yahoo!s and Nokias of the world have demonstrated. The ability to lay claim to a collection of words, like iPod or Googling, is a very powerful marketing tool, and has a real impact on search. Being able to dominate a search term or query space naturally tied to the name of the company is very powerful, especially if the company dominates its industry. Search is as much a navigational tool as one used for information discovery. Training a market to search for your products with terms that you create or control (now with additional help from Google) ensures it is harder to lose share of search. 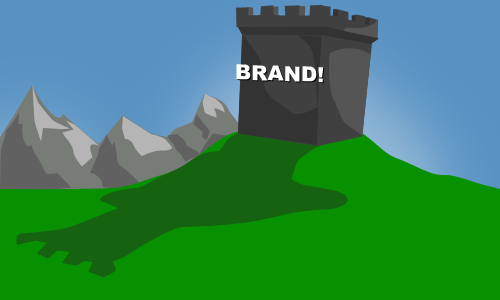 Building a query space where the incumbent has a natural advantage over any invasion is very much a castle and moat strategy. Challenging the brand that ‘owns’ the query space can be costly, and challenging on the brand name itself prohibitively so. Not all searches including a brand term are treated the same way, and not all brands are used alike. In most cases the name itself will return the brand’s main site at the top of search, but without an optimisation strategy, long tail queries with brand terms are still open to competition. The brand’s custodians still need to consider optimising for phrases where a brand term is entered with other qualifying words. Long tail queries like these are still open to direct competition, especially in markets where the brand is used to describe a product or activity, or is used as a proper noun. It is the difference between a search for ‘Nokia’ and a search for ‘Nokia N9 prices Australia’. The latter is easier to optimise for, and there is more of a financial motive to do so. Even with no money to be made, fans will build out the brand’s query space and generate content that will populate the search results, as many companies demonstrate, such as Apple. How a brand manages competition within its query space and optimises both its main and micro sites depends on its business model. A brand that sells product through partners or retailers may not need to optimise for location or transactional searches. Brands whose business model depends on an ad model need as much traffic that is relevant to the advertisers as they can get. An entertainment brand with a specific product offering, such as a TV station or sports team, might benefit from a more focused approach, targeting product specific phrases and usage terms. Most of the options available to these business models apply almost equally for non-branded participants in the market as much as for brands; the difference is in execution. Due to their very nature, brands can affect the search behaviour of the market through other advertising and public relations channels. By announcing new products or creating content and interest around new terms, they can drive search behaviour to terms that they have optimised for, with their primary touchpoints or with campaign-specific content. Marketing a brand in search is different to optimising for general traffic and has its own advantages. Google seems to favour what it defines as an ‘entity’ and creating searches on a word or phrase of your own creation through brand identity and other promotional activity is a real edge. Brands take time and resources to create, but there is value in the result that goes beyond an algorithm update.